Is the KYC Data Hack for Leading Cryptocurrency Exchanges Fake News? Within the last 48 hours, news (re)surfaced suggesting that know-your-customer (KYC) information from some of the largest cryptocurrency exchanges was made available for sale. Yet, there is evidence that this is likely recycled news from over six months ago. 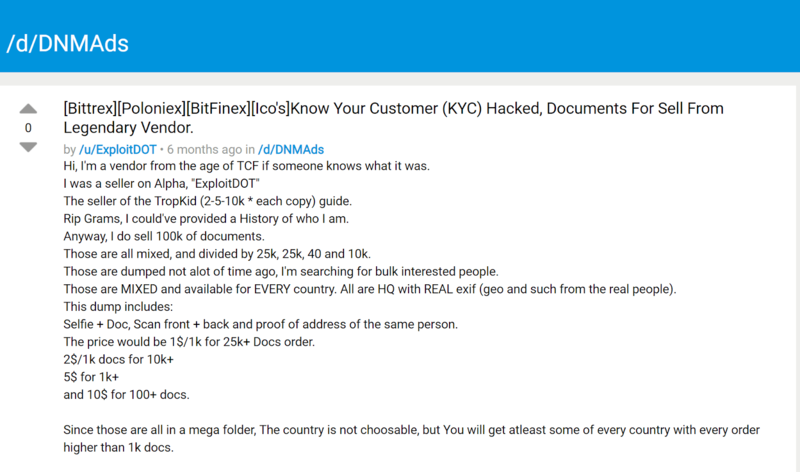 On darknet market Dread, a vendor going by ExploitDOT was reported to have been selling KYC data from exchanges in a sub-community (/d/DNMAds). The post suggested that the data came from larger exchanges such as Bittrex, Poloniex, and Bitfinex. In the crypto-media, CCN claimed that they were provided “three free samples” of the data shown, yet the authenticity and the origins of the data, as CNN mentioned, are debatable. Not only that, there is a real possibility that it is the same leaked data from six months ago. Sanixer, the Telegram username of the person offering this data, told KrebsonSecurity “Collection #1” consists of data pulled from a huge number of hacked site, and was not exactly the hacker’s “freshest” offering, and that the data was two to three years old. Overall, the alleged KYC hack and re-emergence of the information might not be relevant, especially if users aren’t affected. Some in the community have labeled the news FUD (fear, uncertainty, and doubt). And, without any verifiable claims, the community’s assessment could be true.